Mega Man is a highly advanced fighting robot built by the great Dr. Thomas Light. Initially, Mega Man started life as a humble human lab assistant called Rock, but took the difficult decision to upgrade his own body into a fighting machine after Dr. Light's robotic creations were stolen and repurposed by the rogue scientist Dr. Wily. Armed with the mega buster arm cannon and ceratanium armour, Mega Man is tasked with finding and defeating Wily and his army of robot masters to stop them in their plans for world conquest. The Mega Man Running Mega Man 13-Inch Statue is cast in high quality polystone. A variety of painting and finishing techniques were used to achieve the remarkable appearance on the statue. 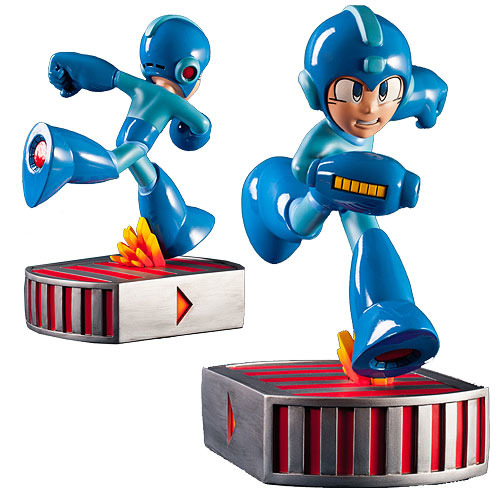 The Mega Man Running Mega Man 13-Inch Statue is a limited edition of 1,000 pieces. The statue is hand numbered and includes a certificate of authenticity. The statue measures about 13-inches tall. Ages 14 and up.